Outlander 4.4 “Common Ground” review: Jamie accepts the parcel of land. He is advised to be careful when choosing men to settle with him. “An agreement with a gentleman is worth it’s weight in gold.” He is expected to help the governor with his agenda. He will definitely regret that agreement and I think he knows it. Marsali is feeling morning sickness and she misses her mother. Claire is very understanding. 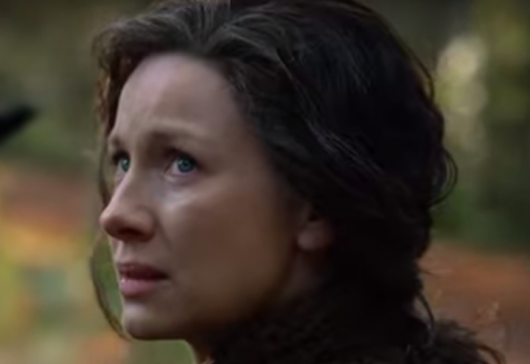 It makes her miss Brianna as she realizes she won’t be there for her and their grandchild. Jamie tries to reassure her. Foreshadowing much? They start marking the cabin site with posts. They find the outermost point between two trees and mark “FR” for Fraser’s Ridge. Then… Indians come up upon them. Jamie drops a knife and introduces himself. They turn and walk away. It is 1971 in Oxford and Roger is distracted. He opens the book that Brianna gave him at the festival, and finds Fraser’s Ridge. Roger receives copies of documents from the author of that book proving that Jamie was in North Carolina. He calls Brianna and tells her that her parents were reunited and lived in North Carolina close to where the festival was held. But then in typical Roger fashion, gets off the phone without telling her how he really feels. Why? He really could have saved a whole lot of trouble with such few words. Jamie shows Claire where all the rooms will be in the cabin, when Ian suddenly comes running. The Indians give chase, throw down all the posts, yell, and then turn away, leaving the Frasers shaken. Claire is worried about settling here, but the mountain spoke to Jamie (of course it did). They decide to speak to John Quincy Myers (Kyle Rees) in the morning to make a gesture of goodwill. They figure out it was a bear once their horse comes back mauled. Myers gives Jamie tobacco and a greeting that will help him get an in with the Cherokee. The Frasers find Myers mauled. Claire and Ian help heal him, while Jamie goes after the bear. There is a vicious fight. Simultaneously, the Indians perform a ritual to kill the evil bear. The juxtaposition between the ritual and the battle is beautiful and violent. The Indians make peace with Jamie because he killed the bear which was an exiled man. They name Jamie Bear-Killer and there is peace between the tribe and the Frasers. I hope it lasts. The Frasers begin to build their new cabin. Roger finds out that Jamie and Claire die sometime in the 1770s by fire he doesn’t want to tell Brianna because it would just break her heart. He talks it over with Fiona (Iona Claire), whose known about time travel all along. When he finally calls and Breonna‘s roommate tells him she left for Scotland a few weeks ago to see her mother. Uh-oh. This episode was just filled to the brim with such good stuff – the bear man (a real bear in the book, but I don’t mind), Brianna off to time travel as well, the Cherokee, and the Frasers finally settling on their new land. I love how the couple stands together through everything. Jamie fighting the bear man is swoon-worthy. Claire’s conversation with the Indian women gave me chills, their knowing looks.